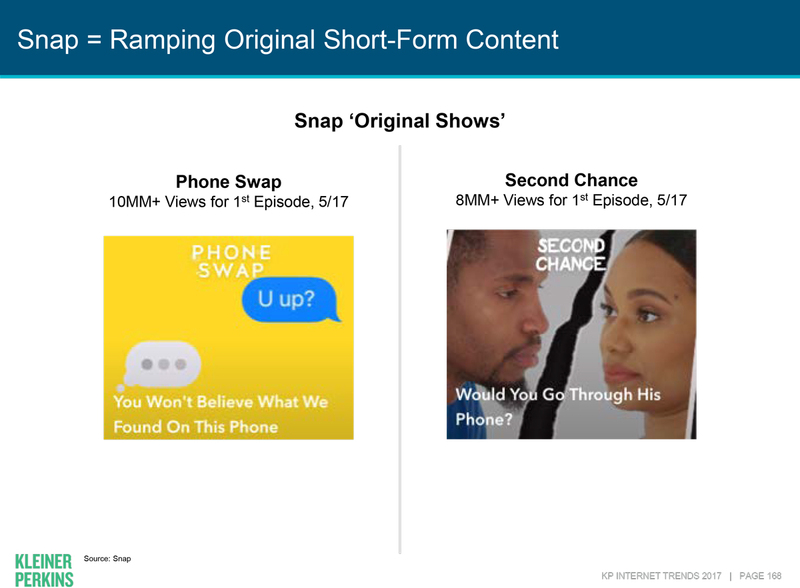 Snapchat’s new original shows like “Phone Swap” and “Second Chance” are attracting a mobile viewership of up to 10 million people, Mary Meeker said in her internet trends report for 2017, citing internal Snapchat data. This year’s report from Kleiner Perkins’ Meeker highlighted the role of Snapchat and rivals like Instagram in the generational shift in media consumption. Snapchat received special mention for its original programs like “Phone Swap,” which features two daters who get to pry into each other’s mobile devices. The show drew 10 million viewers when it premiered in May, and “Second Chance” drew 8 million viewers, according to Meeker’s report, which cites Snapchat’s data. Those are the kind of numbers that get advertisers excited. If Meeker’s report demonstrates anything, it’s that younger people are consuming more content on their mobile devices, streaming from the internet and not plugged into cable. But as ever, comparisons with TV remain tricky. Digital platforms typically counts a “view” any time someone consumes their video even very briefly. TV ratings reflect average audiences over the entire course of a show. TV also has a third-party yardstick in Nielsen that Snapchat does not. 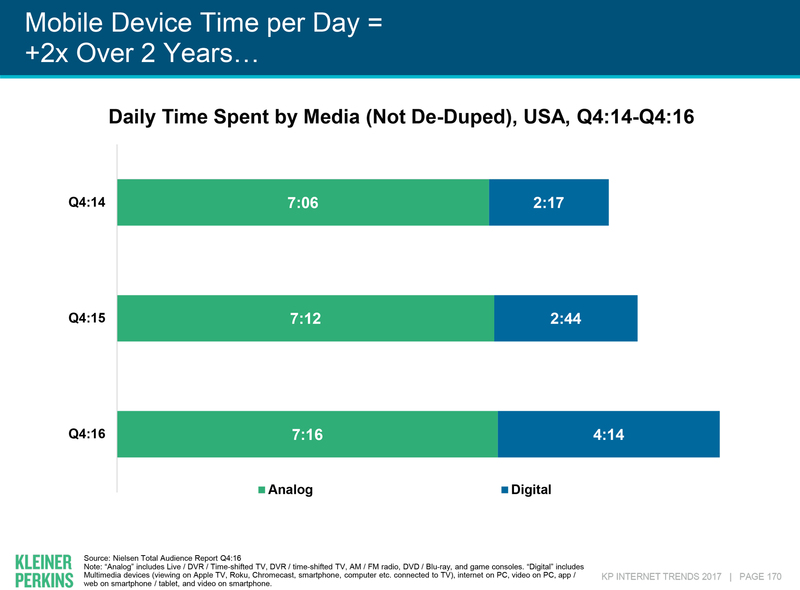 Time spent on mobile devices daily has doubled since 2014, according to Meeker’s report. Snapchat, Facebook, YouTube and others are all competing for that digital attention, and they are getting into areas traditionally reserved for TV, creating original shows built for mobile viewing. Snapchat is going for shows that run for between three and five minutes. Twitter especially has been trying to stay in the conversation with its own live video offerings and original shows. Meeker’s report doesn’t mention the company. YouTube, Facebook, Instagram and Snapchat were the only streaming video properties with enough activity to register. Snapchat generated about 5% streaming video traffic in the second half of 2016, according to the report. 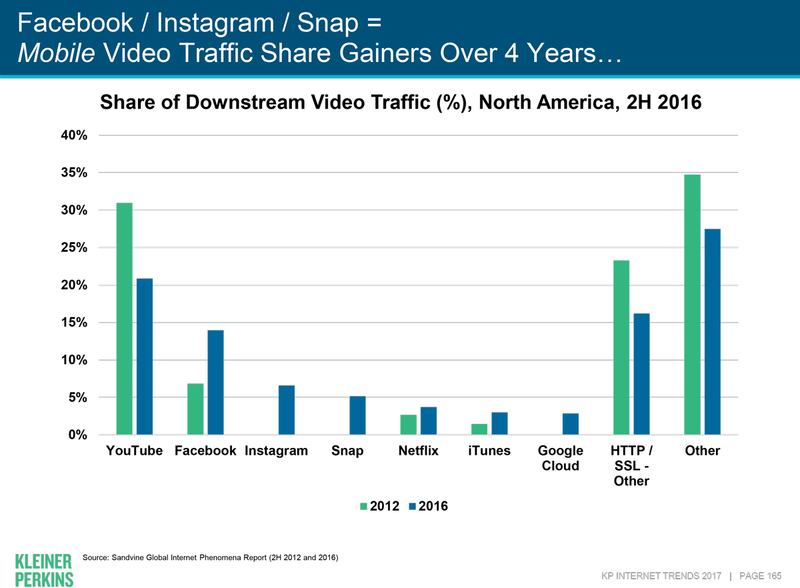 Instagram was only slightly ahead, and Facebook represented almost 15% of mobile video traffic. 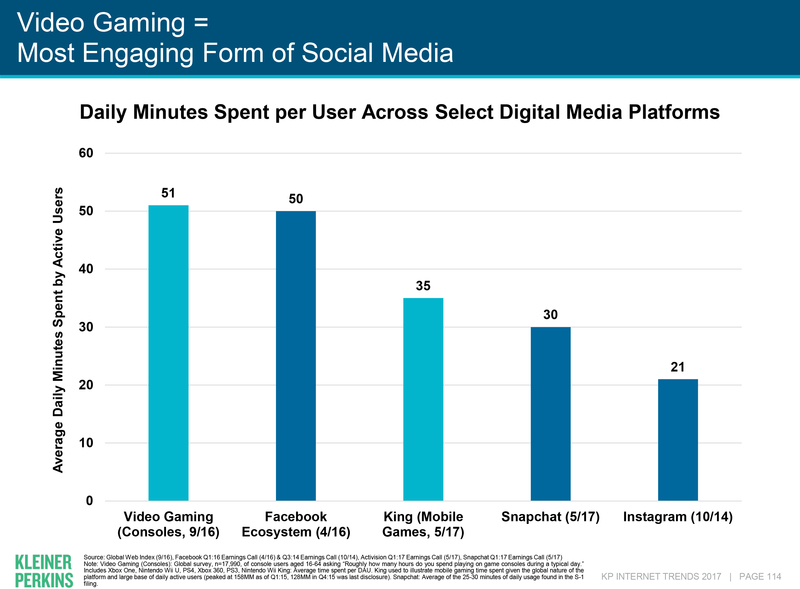 As for time spent, Snapchat topped Instagram with average minutes a day spent inside the app, with 30 minutes per user. Instagram users spend an average of 21 minutes a day there, according to stats cited by Meeker. That’s an important difference because Instagram has been leading Snapchat in total active users, 200 million to 166 million. “Second Chance,” produced by A&E Networks, is another Snapchat show that revolves around relationships, bringing exes back together to work out past differences. Facebook is going after similar programs and striking deals with media partners to develop shows for its platform. “Facebook is poking around, looking to license full-scripted shows,” said one person familiar with the social network’s ambitions. It wants a “Scandal” type show to anchor its lineup, this person said.